I came to water my Desert rose. But, I realised that the base of the branches and the top of the trunck feels a little empty/airy. I kinda forgot to water it for maybe a month. So, I am thinking the branches are like that, because they have no water to store? Will my DR be allright? Are they soft and squishy? If so you have over watered, and the plant probably won't live. They are such fussy plants, they need lot of heat, not too much water, and special cactus mix if transplanting them. Try giving it a squeeze test, see if it is soft? If you are buying one of them in the store, make sure you do the sqeeze test, because if they are soft, leave them there! Good Luck. Well, after watering it, it got worse. I thought it needed water as it was weeks it didn't get water. So, I thought maybe the water reserves were empty. It does get a lot of sun. I squeezed it a couple of days ago. It feels squishier. It will probably not survive. But, you never know. I will let it dry. No more water for a long long time. I have never grown this plant, but my understanding is that they are not to be watered at all during the winter. Otherwise, they rot. I have a feeling you have lost your plant. They shouldn't be 'IN' the bright sun, just out of it, not near cold windows. But if it's that squishy, sounds like it's a goner When choosing one in the stores, always test the big root bulb, by softly squeezing it. If it is soft, look for another. 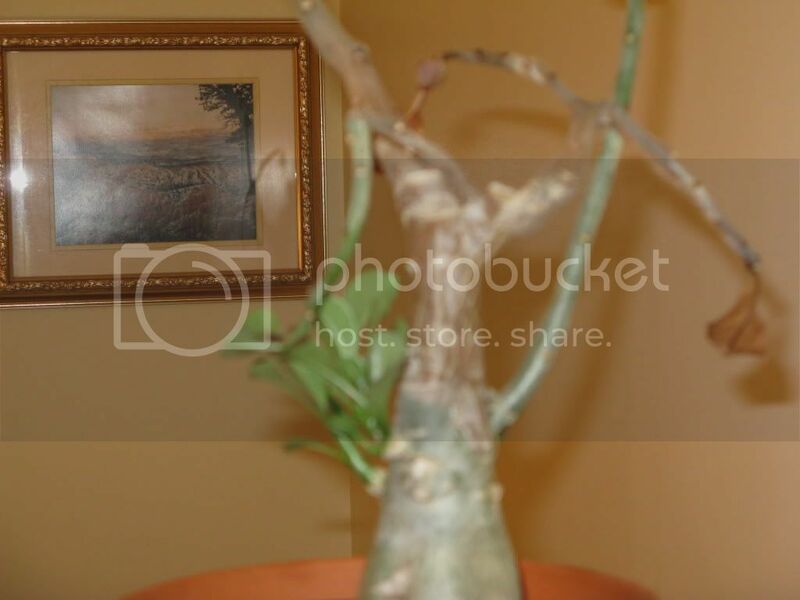 Because it might look OK now, but won't live, as someone else has over watered it. They really are picky plants, Unfortunately. The plant is still living. A bunch of leaves are growing at the bottom of the trunck and there is even a few flowers!!! But, the top part is still the same. Not worse. I've been thinking of chopping off the top part. Should I do that??? Then, keep the remaining intact branches to start new plants. That's fantastic!!!!! 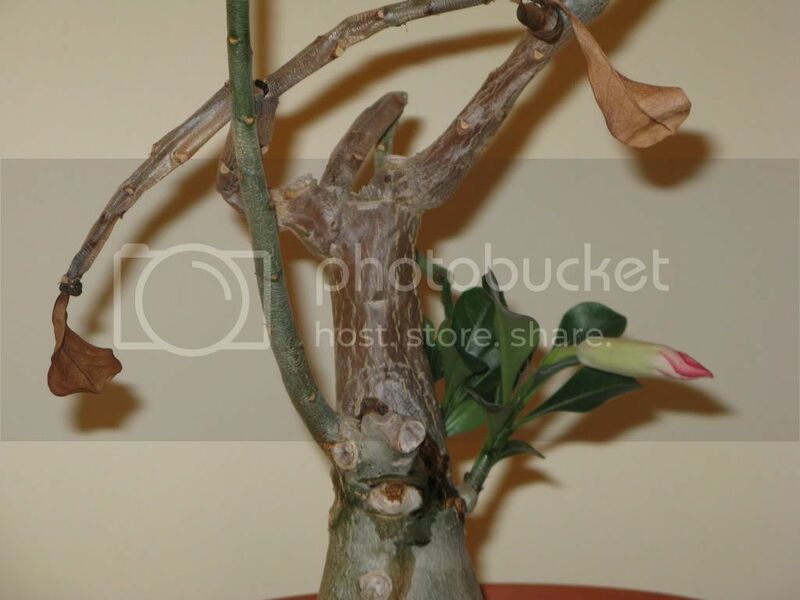 Is there anyway you could post a picture of your desert rose? I almost think, ( unless I saw it) that I would leave well enough alone and just let it do it's thing. Must be happy if it flowered as well as sending new shoots out. Congrats!!!! Those are such finicky plants, but worth the trouble!!! Thanks! Yea, I'll post pictures soon. I am just surprised by how the bottom part and one side of the plant is really going well while the top part and the other side is rotting. Question is, should I cut the rotted parts.? Well let's see a picture and then go from there. You probably will need to, as it might spread. Have you noticed it spreading at all??? If you do cut it out, make sure you have a real good sharp knife. Good Luck on that one. It looks like something is oozing out!?!? If you could tell me where to cut, it would be great! Also, what do I do after cutting it??? Let it dry or put something on the cut? Well I haven't seen a desert rose come back like that, EVER???? I'm really not sure where you should cut out the rot??? The goofy thing should have been dead by the looks of it, but it has new healthy leaves and flowers???? I saw what you meant about it sort of seeping fluid, (which is poisonous, by the way) I wouldn't be touching that, unless you are going to make poison arrows LOL!!!!! I "think' I would start at the top and just take the absolute deadest stuff off, then leave it and see how that goes. Do it slowly in stages, you might have to cut on an angle, by the looks of the dead parts. If I kill your plant, YIKES!!! I will take all the blame, lol. Seriously though just go real slow, on the pruning. There was a very extensive thread on the desert rose plants awhile back, if you look and try and find it, the person on there had fantasic desert roses. You might contact them, and send your pictures and information, BEFORE pruning??? Hopefully they can give you more help than me? If you do hear from them, please let us know what they say? Would really be interesting, to know what they say. Good Luck. Thanks for the info! I'm definetly gonna cut the rotted branch. Not sure about the rest. I did forget about the poison on the plant... Lol. Thanks for reminding. I thought I could update this. I still havn't watered nor touched the plant. It is still growing well except for the rot. 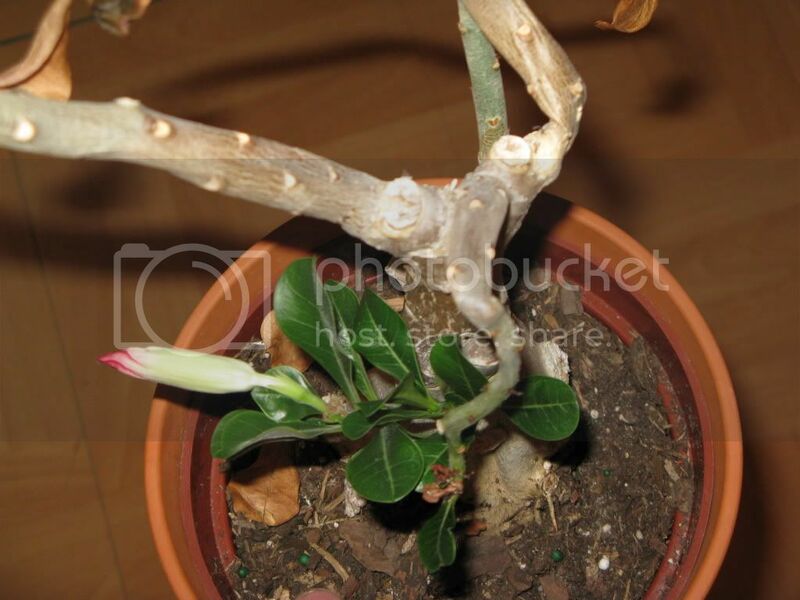 Is it easy to reproduce a Desert Rose? Well I haven't found it easy to reproduce them. I seem to have enough trouble keeping mine going. Although they are in a state of dormancy right now. Sounds like I would just leave well enough alone. If it's still alive and growing, it's doing fantastic, considering the way it looked. I really thought it was a goner!!!! I guess I won't touch it. Funny thing is that since I posted this thread, I havn't watered it since. But, it is growing more leaves!! !